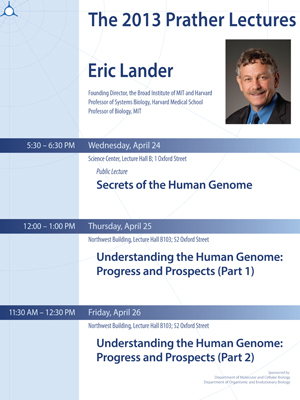 The annual John M. Prather Lectures in Biology will be presented by Eric Lander, the founding director and core member of the Broad Institute of MIT and Harvard and professor of systems biology at Harvard Medical School. A child of Brooklyn, mathematician-turned-geneticist, Rhodes Scholar, and MacArthur Fellow “genius,” Lander was a principal leader of the Human Genome Project and in 2005 helped spearhead The Cancer Genome Atlas project to identify the major mutations in human cancer. A dynamic speaker and popular teacher with a legendary ability to engage large groups of researchers and empower individual scientists, Lander will present a public address on April 24, 2013 and two lectures on April 25 and 26, 2013. The Prather Lecture Series on Biology is sponsored by the Department of Molecular and Cellular Biology, the Department of Organismic and Evolutionary Biology, and the Science Center Lecture Series. Refreshments will be provided prior to each lecture. Eric Lander and his colleagues have created key tools of human genomics and used them to map and sequence the human, mouse, and other genomes, and to explore the basis of diseases, including cancer, diabetes, and inflammatory diseases. Lander seeks to understand: the functional elements encoded in genomes through comparative analysis; human genetic variation and its relationship to disease susceptibility; the distinctive cellular signatures of diseases and of response to drugs; gene regulation; and the mutations underlying cancer. Lander is a member of the US National Academy of Sciences, the US Institute of Medicine, and the American Academy of Arts and Sciences. Among his many awards, in 2013 Lander was among the first 11 recipients of the $3 million Breakthrough Prize in Life Sciences, which honored him for discovering general principles for identifying human disease genes and enabling their application to medicine through pioneering work to create and analyze genetic, physical and sequence maps of the human genome. The John M. Prather Lectures in Biology were founded in 1939 by a bequest of $25,000 from John McClellan Prather, A.B. in 1894. The annual income of the fund is to be used to pay for the services of eminent lecturers on botany and zoology alternatively.